Is there an Acer battery management tool that limits the battery charge? Should I even bother? I have a personal laptop (Lenovo Z470) at home and what I like about it is that its battery management software has a setting called "Best Battery Health" which makes the laptop stop charging at 50% battery capacity. It's useful because I used my laptop 8+ hours a day, everyday. Although I total discharge it about once a month. Now I have a new job and a new laptop was provided me, an Acer Aspire E1-572G. Its battery tool doesn't have that feature, and googling didn't come up with any results. So do you guys know any software that does the same thing on Acer notebooks? Or if it's not the best practice (to keep the battery at a certain level), what is? I'm asking because I'll be using this laptop the whole day. Any recommendations? Thank you. PS: I noticed on my Lenovo notebook, when I set it to Best Battery Health then reboot to Ubuntu, the battery threshold remains, so I'm thinking it's not totally a software thing. It may be hardware-related, too, but I don't know. Thanks again. I was skeptical of this affirmation so I did some research and stumbled with this article. And it brought back vague memories from back when I studied physics about condensers. Now before we start, I want to point out that to my understanding, saying battery is fully charged makes just as much sense as saying a balloon is fully charged; this limit is too extreme since it's where it's the limit where it explodes. So the battery is never fully charged. Give this graph I found a look: It's very descriptive. When connecting the battery to a specific voltage by using your charger, the charge behaves as you can see in the graph over time. It charges the battery quick first and then slower until it reaches a point it will charge so slow we don't consider it charging anymore. This is probably the moment your laptop says battery 100%. If you charged the battery using a higher voltage, you'd raise this limit, the battery would charge faster and it would have a longer discharge duration at the expense of making the battery "suffer" and hence reduce its life. Too much voltage and KABOOM BABY! On the other hand, if you use a lower voltage to charge the battery, it would take the same time to charge it to... let's say 50% of last scenario (and it would be limited there), so you'd have less juice through the day but the life of the battery would be prolonged. I bet your laptop would also state the battery is at 100%, even though it now has half the charge as before. So in conclusion, you shouldn't focus on charging your battery less to improve its life, but to charge it slower by reducing the voltage (which will put a limit to how charged it gets hence charging it less). But on the other hand all new batteries probably have internal mechanisms which regulate all of this so you don't even need to think about it. Oh, and about programs to limit this; it MUST be supported by acer from the BIOS. If it isn't around, then it's probably just not supported. Many users do not use their notebooks too often on the go, and they are plugged to AC nearly all the time, keeping the battery charged at 100%. This is the worst mode of operation for ANY lithium-based battery. My friend's HP Probook 4535s has a Windows utility which allows to specify the charge limit to 50%, 70% or 100%. They say 50% is for maximum battery lifespan, 100% is highest single-charge run time and 70% is good compromise. I wish there would be such a possibility for Acer Aspire. For now, I normally let the battery charge to about 50% (which is an ideal state of charge for Li-based batteries) and remove it from the laptop. When needed, I just put it there and it charges to 100% in about an hour, which is acceptable in most cases. And when not, I still have those 2 hours at 50% which is sufficient for most of my on-the-go activities. 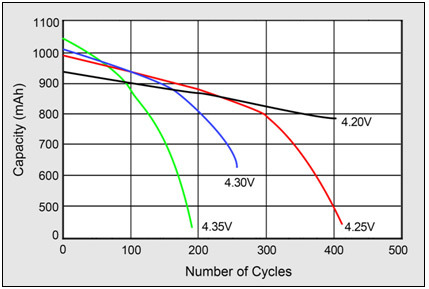 Keeping a battery at a maximum of around 3.9v avoids stress induced capacity losses. So I charge my battery to 50 percent and take it out. When I want to go out or wander around the house I pop the battery back in. Once every 6 months I give the battery a full cycle. 3 years later its still giving me 2 hours runtime on a huge acer 8930g. Keeping your battery in a hot laptop fully charged is killing it badly. After 1 year it may lose 30-50 percent capacity. I use a WiFi programmable socket which can be operated by software on the laptop. I have a script that runs every 5 minutes and when the battery charge is over 70% it turns the socket off. When battery charge is below 30% it turns the socket back on. (Charger plugged into socket, of course.) After several years the battery capacity on this laptop is holding up better than previous laptops which were allowed to charge to 100% and left on charge nearly indefinitely. Not the answer you're looking for? Browse other questions tagged laptop battery acer-aspire or ask your own question. Extend battery life of a laptop leaving it plugged in, is this relevant? Is it safe to buy a replacement laptop battery that has slightly different voltage than the original? Is the 40% - 80% laptop battery rule still relevant?